The Itsy Bitsy Spider Crochet: The owls come marching in! The owls come marching in! Asleep and Wide Awake, originally uploaded by Princess Crafts A Lot. More owls are tumbling in to the Flikr group! Check out this adorable pair by Shanny of PrincessCraftsAlot! 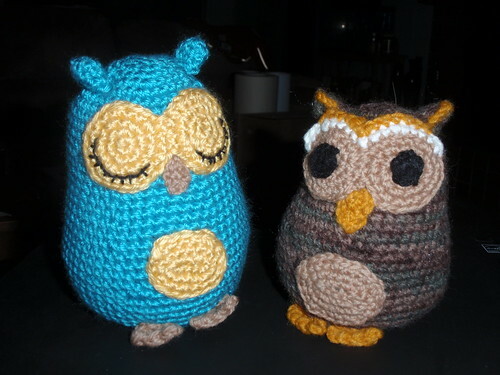 She calls them "sleepy head owl" and "night owl." I just love the creativity that folks are already pouring into this design and I'm so excited to see what's next! Speaking of "what's next," today is the last day to sign up for the Great Owl Crochet-Along. We already have 50 hookers hailing from Australia to the Netherlands and plenty of places in between, so I can tell you that this is going to be one wild party! If you haven't seen the getting started posts that have already been published to help you on your way, make sure to check out the Great Owl Crochet-Along main page. I'll be keeping a post index, link to the Flikr group, participant blogs and plenty of other goodies here, so this is a page that you're going to want to add to your favorites right away! And, I plan to get started on my demo owl here over the next day, so be on the lookout for more hooter hookin' lessons! aww, I love the sleepy head owl! I am working on one now with a bulky-weight yarn. What a great pattern! Thank you for sharing it with us! !